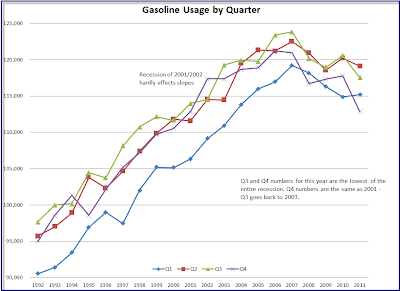 On February 6, I noted (with huge thanks to reader Tim Wallace) a Huge Plunge In Petroleum and Gasoline Usage. Tim used weekly numbers, which show, much week-to-week volatility. Instead, I proposed using rolling three-month averages, compared to the same three months in prior years. 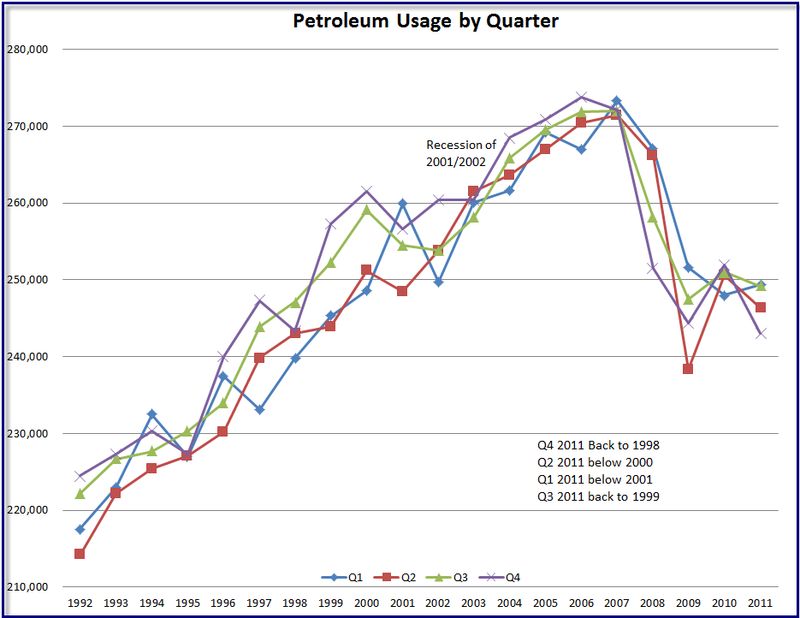 Today I received some updated charts that are much easier to see precisely what is happening. 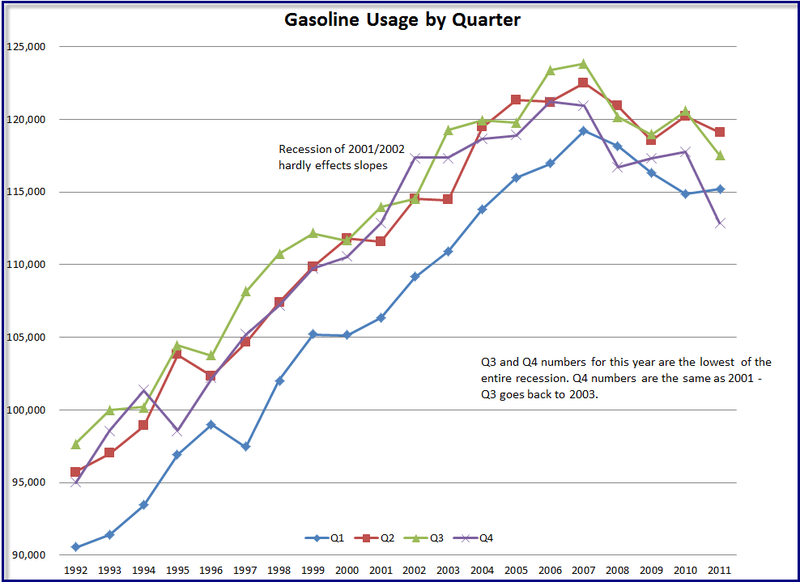 Wallace writes "Gasoline and petroleum demand recently has plunged more than at any time in the recession. 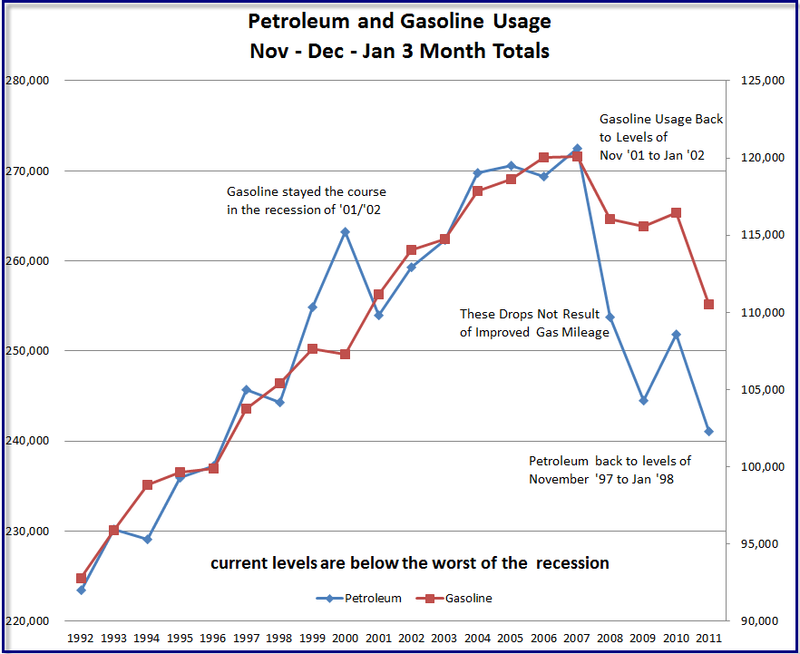 When you see petroleum usage back to numbers in the 1990's, you know there is serious economic trouble no matter what the talking heads say." 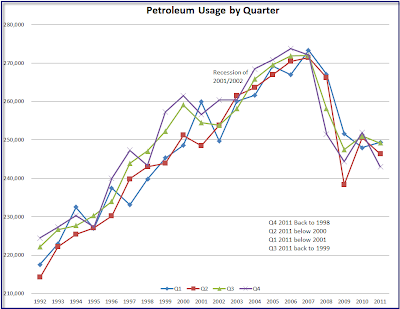 Wallace willing, each month I will post the "Petroleum Rolling Three-Month Average Index". 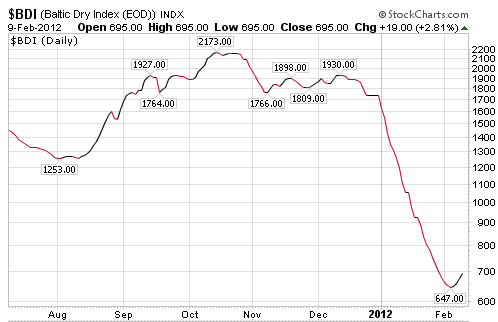 Hopefully we can get a derivative of that first chart, "Percent Change From a Year Ago". At the end of February the comparison will be December - January - February vs. the same three months in prior years. Amazingly, shipping rates have dropped so low, shippers will pay you to ship, just to get the cargo vessels to better locations. The vessel will haul a cargo of grains to Europe, putting the carrier in a better position for its next shipment, he said. “Our other option was to stay in the Pacific and earn poor revenues or ballast to the Atlantic and pay the fuel ourselves,” Rodley said. Ballasting refers to sailing without a cargo. Charles Watenphul, a spokesman for Glencore, declined to comment in an e-mailed response to questions. Charters for the so-called backhaul routes that reposition ships to the Atlantic Ocean region from the Pacific are falling to the lowest since indexes started, exchange data show. Rents for Capesize ships that haul ore and grain on backhaul routes were at minus $7,342 a day, the lowest since that index began in 1999, exchange data show. D/S Norden A/S, Europe’s biggest publicly trading commodity shipping company, said Feb. 3 it hired a Supramax vessel at no cost other than fuel charges, its first such transaction in a quarter century. 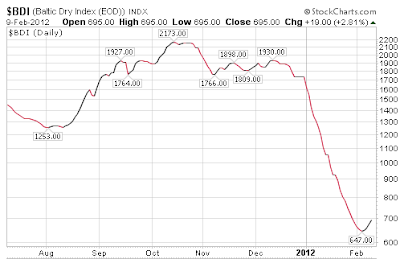 The Baltic Dry shipping index (a measure of shipping costs) was down 32 days in a row before turning up on Tuesday. 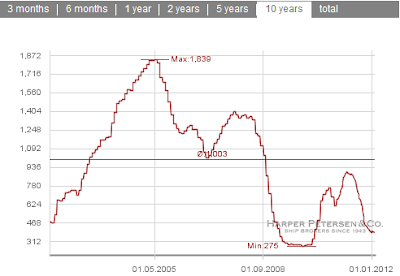 The Harper-Peterson Shipping Index is also in dismal shape. Many ships came online in the last couple years but a plunge this deep cannot be blamed entirely on new ships added. 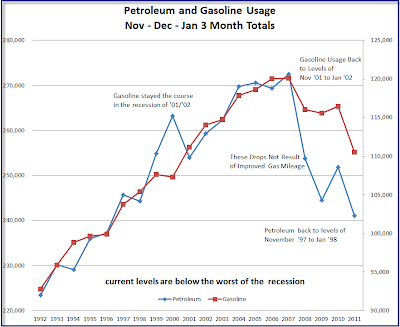 Rather, the huge dropoff in gasoline and petroleum usage in the US, coupled with falling shipping rates, a drop in Japanese Exports Three Consecutive Months, and a European Recession poised to get much worse, makes a strong case that a collapse in global trade is underway.